Easy Recipe tip: Slice up green, red, and yellow bell peppers and drizzle with olive oil; shake on a teaspoon or more of this salt-free Herbs du Beaumont herb spice; grill on medium high heat for 10-20 minutes or until slightly charred; squeeze on a shot of lemon and plate with your main dish. This is an ALL herb, spice and vegetable blend made WITHOUT salt or salt-substitute. This was developed for a dear friend of the Texas Coffee Company, Winnie. Winnie’s doctor drastically limited the sodium intake in her diet, which you can imagine takes quite a bit of flavor out of most meals. 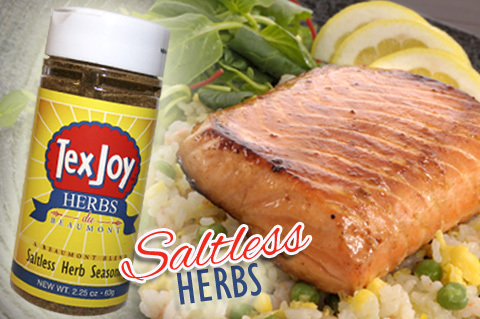 But with this TexJoy seasoning blend, she is able to add flavor to all of her meals without the use of salt. Yes, please bring back !! Love this seasoning, it's wonderful on grilled vegetables and so many other things too. Please bring it back!